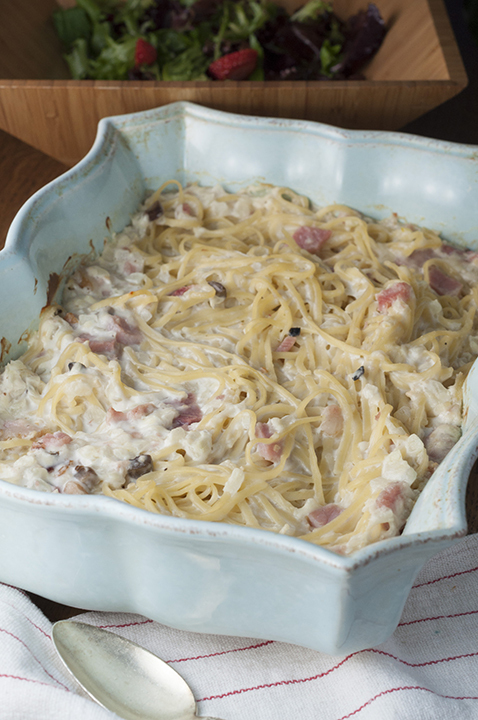 Creamy Baked Ham Fettuccine Alfredo is an easy to make comfort food pasta dish using leftover ham that will leave your family asking for seconds! How is this for perfect timing? I’m sharing this Creamy Baked Ham Fettuccine Alfredo with you today as the perfect way to use up your leftover Easter holiday ham. I make hams throughout the year, not just on Easter. I highly recommend using this recipe anytime you’re craving ham. It comes together so quickly and I love that it’s baked in the oven! 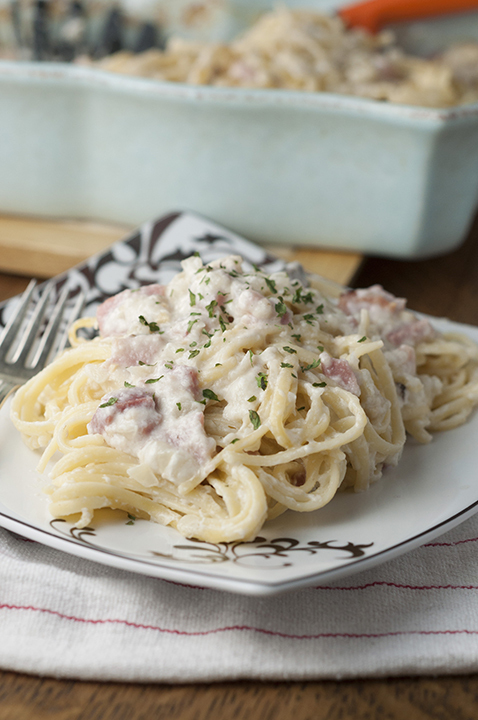 You have had pasta alfredo with chicken and shrimp before, but have you ever tried it with ham? Don’t let the idea of ham in your pasta scare you away from trying this. It was SO good, guys. This obviously isn’t exactly friendly to your waistline, but I had to include my BFF: sour cream. 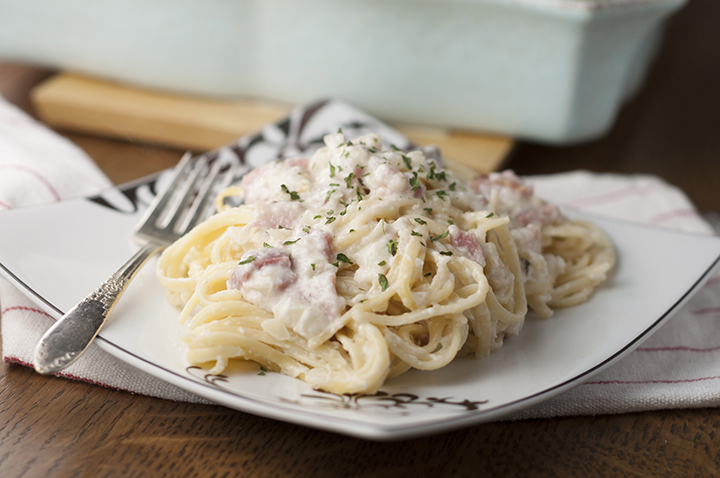 It gives the dish the creaminess that any alfredo sauce needs in order to be classified as “alfredo”. 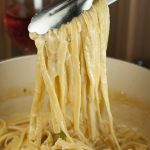 If you wish to try a lighter alfredo sauce, definitely check out my Greek Yogurt Alfredo Sauce. The addition of the juicy ham makes it a hearty and complete meal. 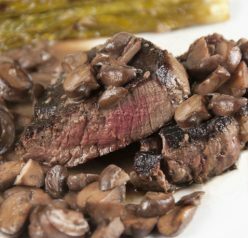 Feel free to add peas if you so desire or your choice of meat (chicken, shrimp, etc.)! I may or may not have devoured some of this Creamy Baked Ham Fettuccine Alfredo straight from the baking dish like a hangry hot mess. In a mixing bowl, combine the ham, 1 and ½ cup cheese, cream of mushroom soup, sour cream, garlic and onion. Add the drained pasta to the ham mixture and stir until pasta is fully coated. Spray a 13x9 baking dish and transfer the pasta into it. Cover and bake at 350 degrees for 30-35 minutes. Uncover and sprinkle with remaining cheese. Bake for an additional 10 minutes or until cheese is fully melted. This looks so good! Almost nothing beats a creamy & delicious pasta dish in my opinion! Oooh, I love that this is BAKED! And this is such a wonderful way to use up any leftover Easter ham. Fantastic! Such a perfect comfort dish, saucy pasta dishes are among my most favorite! 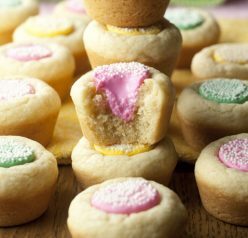 Love this idea for leftover Easter ham!! !